In August 2010, six of our high school participants took part in a summer arts workshop led by ARTS By The People’s teaching artist Sarah Valeri. During this workshop, our participants visited museums, art galleries, and art supply shops, and then spent four hours creating work in Sarah’s art studio in Brooklyn. This was the first workshop of its kind, and the work they produced was bold and surprising, as you can see from the photos here. The Brazilian Carnaval Festival was a residency program for youth grades 1-8 at the Unity Charter School. “Street Art to the World” is a documentary about Art’s By the People unique street art workshops. 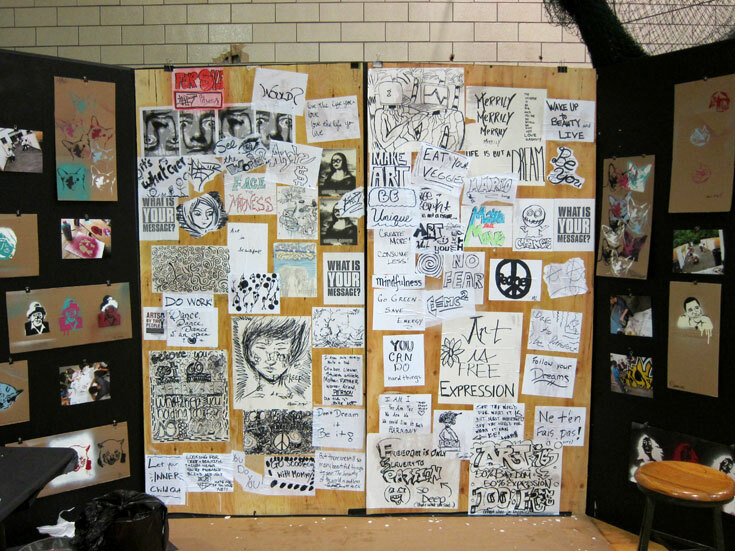 In 2011, ARTS By The People was invited by Morristown High School’s Art & Design Department to host their Art & Design Show. In our inaugural year, our teaching artist Brad “Bisco” Smith and our interns created an evening of live art and displayed the participants’ 4’ x 8’ murals, shown below. This project was made possible by a special donation to ARTS By The People. In 2010, one of our teaching artists, Sarah Valeri, flew to Bogata, Columbia to work with a group of elementary – middle school aged students. ARTS By The People was invited to this special place to lead a week long workshop, bringing our unique blend of expressive and visual arts to the students of Club Michin. Below is Sarah working with some of the participants as well as the artwork they created. The lecture series, Murals to the World, was a week long series of meetings, receptions, and discussions about ARTS By The People’s groundbreaking workshop Hip Hop for the People in Jerusalem, Israel, led by Brad “Bisco” Smith and Gustav Gauntlett. Pictured here are the two teaching artists speaking at Lester Senior Housing and Artist Baker about their project in Israel. 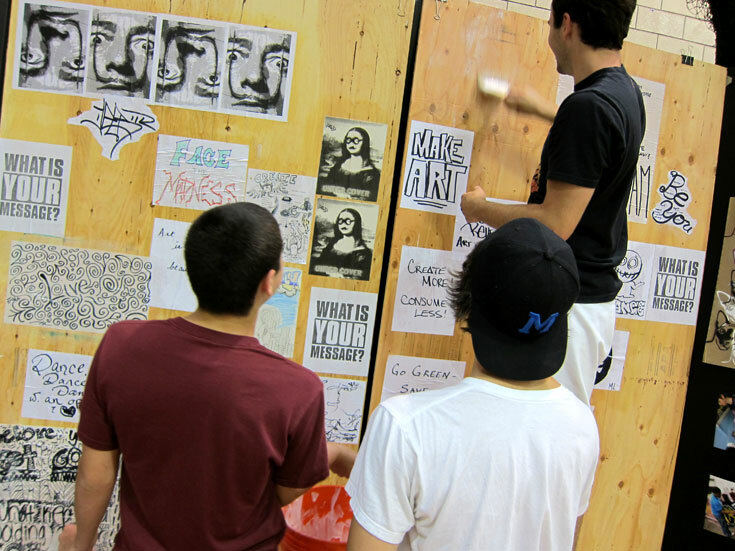 Based on the success of the previous year’s Art & Design Show, Brad “Bisco” Smith created a live art presentation that included mural photography and a live art battle for the students of Morristown High School. The live art battle featured three teams, three canvases, and one hour to create a mixed media work on canvas. Winners took home prizes, including a gift certificate to a local art supply store. See photos from the show below. 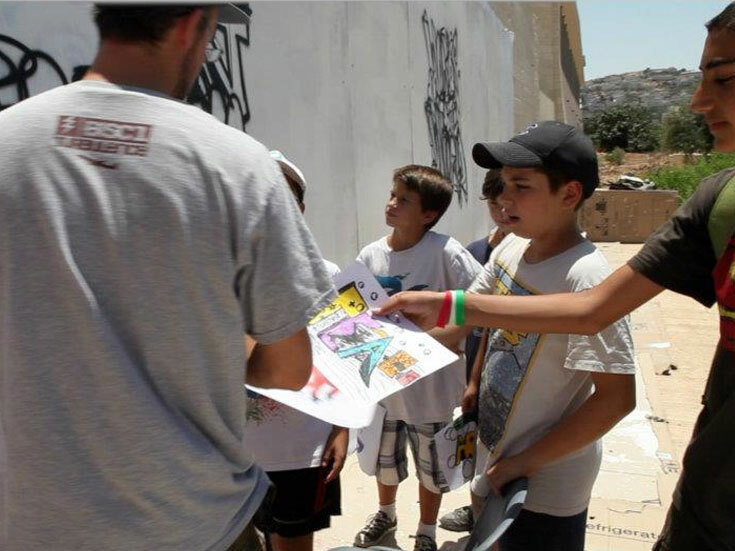 In July of 2012, ARTS By The People sent two of our teaching artists, Brad “Bisco” Smith and Gustav Gauntlett, to Jerusalem, Israel to run a hip hop songwriting and street art workshop with Arab and Jewish middle-school students. The workshop included a group of 52 students between the ages of 9 and 14 years old. 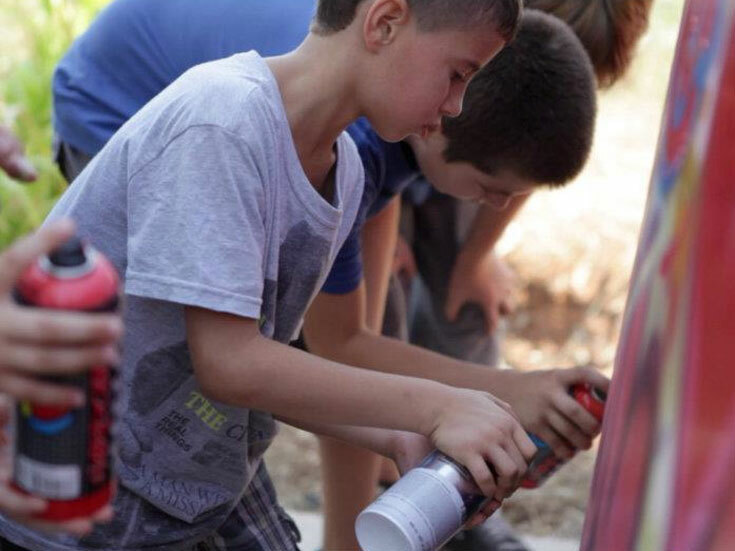 They learned about the techniques and history of socially conscious street art and designed and completed their own 32’ x 8’ mural. They also learned about the history of hip hop and wrote and recorded a song in 3 languages: English, Hebrew and Arabic! The workshop culminated in a mixed media performance that included all of the different elements from the sessions. Here is a link to the song Peace! created in Gustav’s hip hop songwriting class. Check out the song Peace! created in Gustav’s hip hop songwriting class, Bisco’s documentary Words to the World – The Making of a Mural, and photos from the week below. The Morristown Emergency Medical Services (EMS) Mural was a project designed by Brad “Bisco” Smith to honor the volunteers of Morristown, New Jersey. 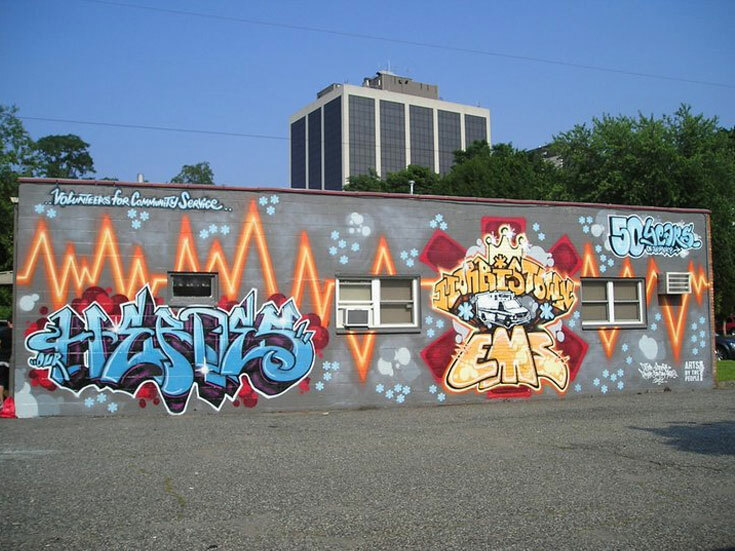 Bisco led a group of Morristown High School students who were selected from his socially conscious street art workshop to create a mural on the EMS building. These pictures document the process and final product of the mural. Click on the links for additional press about this project. In 2011, teaching artist Gustav Gauntlett presented to the board a proposal for a documentary about the need for workshops that allow freedom of artistic expression to middle school and high school students. After researching many organizations, he asked ARTS By The People to be the organization for the film. The result is this documentary that was also featured in the 2011 Morristown Film Festival. Photos taken at the reading from the Bloomin’ Humans poetry workshop at Two Bridges, Lower East Side. 17 young poets shared their poems created during the 8 week workshop. Congratulations to our teaching artist, Libby Mislan. For the past four years ABTP partnered with Lawton C. Johnson Middle School in Summit, NJ, to bring a day-long arts workshop in honor of Santiago “Santi” Abut. Santi was a student at LCJ Middle School when he passed away from an illness. Santi’s father formed a foundation in honor of his son who loved the arts. This years event called, “Positively Dedicated,” combines the talents of four of our teaching artists and three interns working together with 45 middle school students. The students rotated through 4 workshops that included breakdancing, poetry, street art and documentary film. Here is the film that the middle school students conceptualized, filmed and edited.